One of the central components of the credit counseling process is the credit report review. This serves a variety of purposes, and can help clients gain valuable insights into their financial situations. It also supplements the FICO score that we provide at no charge, making for a great free combo that can help just about anyone. Let’s take a deeper look into the mechanics of how we pull a credit report at Clearpoint, along with how that information plays a role in our counseling. Why is it necessary to pull a credit report? We understand that some consumers might wonder why this step is even necessary, and they might have concerns about the credit pull hurting their credit. It’s important to understand that the reason we pull the credit report is really so that we can provide the best service possible to our clients and gain a big picture understanding of their finances. The report provides a look at details that clients might not be aware of but that can have serious implications. It’s also through this process that we ensure that our recommendations are personalized to the individual. Also, when we pull a credit report, it’s a soft inquiry. This simply means that there is no impact to the client’s credit score and it won’t be visible to lenders or any other third party who views the report. It will show, however, when the client pulls his or her own report. Secondly, we work exclusively with Equifax when pulling reports and scores. They are one of the three main bureaus (Experian and TransUnion are the others) and information can vary slightly between the three. Because of this, we recommend that consumers check their credit reports with each bureau, which can be done for free once every 12 months at www.annualcreditreport.com. Now, let’s dive into how our counselors use credit report information. Since the primary goal of credit counseling is to provide a personalized action plan for how a client can improve their financial situation, the most obvious benefit to a credit report review is that the counselor gets access to basic but critical information. This includes the number of creditors and open accounts a client has, the outstanding balances the client is carrying and insight into any negative marks (such as accounts in collections) the client has acquired. Once this information is gathered, the counselor collects additional details about the client’s budget, including what they spend on everything from housing to groceries to haircuts. With all of these numbers in hand, the counselor has the full context of a client’s situation both in terms of credit health and the overall monthly budget surplus or deficit. From there, the counselor recommends practical strategies that can have a meaningful impact. These overall financial suggestions are great, and for some clients the conversation can stop there because their situation is manageable, and with only a few minor changes (like cutting cable and eating out less) they will be on a path to stability. For others, though, the credit report review reveals that the debt situation is much more urgent, and in these cases the counselors can further explore our Debt Management Program with the client. By reviewing the credit report and seeing a list of the lenders and creditors owed, our counselors are able to determine which concessions may be available. For instance, if a client owes money to, Acme Credit Cards Inc. and is currently paying 18 percent interest, our arrangements may allow the interest rate to come down to nine percent, and even have the monthly payment lowered. If there are a variety of creditors who fit this mold on the report, then the counselor will likely recommend the DMP as an option and can show the savings that the plan will provide. It’s easy to see why a thorough credit report review is so critical to determining whether a client will be a good fit for this sort of program (note: our counselors inform everyone about how a DMP could fit with their situation, but for some clients we recommend it more strongly than others, based on individual needs). In some cases, our clients have already experienced prolonged periods of financial difficulty and their credit report contains multiple negative marks, such as collection activity or even bankruptcy. Our counselors can address questions about these accounts, make suggestions on how to proceed and explain when various negative marks will drop off the report. 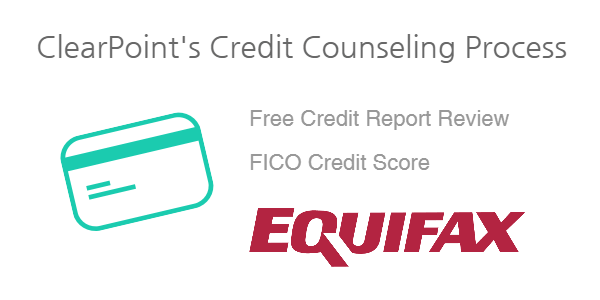 We mentioned earlier that we also provide a free FICO score during a credit counseling session. Well, with that combination in hand (the score and report) our counselors are able to identify two very important things: 1) why the credit score is at its current level and 2) the steps clients can take to bring about improvement to their credit scores and overall credit standing. During a credit report review, it’s quite possible that the counselor will uncover inaccurate information (in other words, a mistake on the credit report). After all, about 25 percent of consumers are estimated to have errors on their credit reports and around five percent are predicted to have errors with serious financial consequences. If the client has not recently checked their credit, this can be an invaluable resource. Incorrect information on a credit report can range from harmless (such as a misspelling of your name or a wrong address) to serious (such as a collections account that doesn’t actually belong to you). Whether the counselor finds one of these errors or a client has already come across one in their own report check, we can explain how to go about fixing them and how to approach the bureaus and original creditor (when necessary) to ensure that correct information is displayed. As you can see, the credit report review is a critical part of credit counseling. There are no negative consequences and the counselor is able to gain significant insight into a client’s situation. Not only that, but the information in the report, combined with the client’s monthly budget and personal preferences, guides the next steps and helps the counselor determine the best course of action. When you combine this service with that of a free credit score, it’s easy to see that credit counseling is a free and effective way to gauge your level of financial health and improve your standing. Want to work with one of our counselors to take a deeper look into your financial situation? Just fill out our form to get started. I just got married a couple of months ago. My husband and I have been having a little trouble gaining some perspective on our financial situation. That being said, we have no experience with credit counseling and didn’t really know if it was necessary. Thank you for a thorough explanation, it was really helpful and I feel like I have a better idea of how it could assist us in our particular situation. Thank you for reading and for the feedback, Natalie. Glad you found it helpful! I hope that credit counseling can provide some benefit to you. Best of luck on your financial journey!